I am a PE teacher and coach girls basketball and track at Hall Middle School in Weatherford. We have 3 dogs, with Harper our newest show dog. Lance Rankin has a birthday today. Lance Rankin updated profile. View. Scout and I in Oklahoma. Scout is a 10 year old AKC Champion Samoyed. Scout and her daughter Misty. 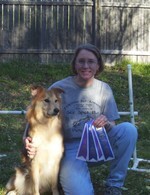 Misty reached excellence level in AKC Agility before retirement. My wife Amy and her dog, Annabelle. Annabelle has 19 agility titles. Amy and her Australian Shepherd, Gracie. Gracie has 16 agility titles.